Italians tend to enjoy a late evening meal – especially in the summer, and the real atmosphere in the restauarnts commences from 20:00 onwards. 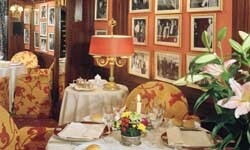 A full traditional Italian meal would consist of a starter (antipasti) followed by a first course – usually a soup or pasta dish (primo piatto) and then a second course – usually meat of fish with a side dish of salad or vegetables (secondo piatto) all rounded off nicely with the establishments desert speciality (dolce della casa) and coffee and liquor. Rome is a maze of Restaurants, Trattorias and Pizzerias and you will be spoilt for choice eating out in this city famous for it’s rich and varied cuisine. 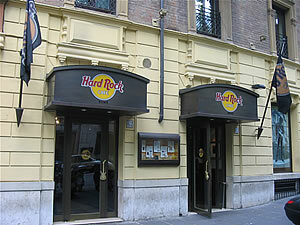 (Via Vittorio Veneto 62 a/b) - For the more international traveller the Hard Rock Cafe is an institution. Located just around the corner from our bed breakfast the well known Hard Rock cafe offers it’s rock n’roll atmosphere for dining in an upbeat and lively fashion! With an indoor restaurant as well as a large glass booth on the street (which distinguishes many eateries on Via Veneto) here you can sample varied dishes of meat, fish and vegetables with generous helpings of french fries and jacket potatoes before rounding everything off with a large ice cream sundae or cheesecake! 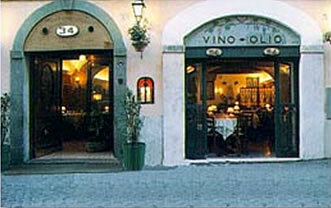 (Via Mario de’Fiori 34) – for those wishing to sample a more traditional cuisine the renowned AL 34 Ristorante is not far away. Located near the bottom of the Spanish steps this is a perfect evening stroll away and will give you a perfect taste of italian cuisine at it’s best. Tantalizing dishes include chick pea soup, oven roasted fish and potatoes, messinese sword fish rolls, and ‘black’ tagliatelle accompanied by prawns and cherry tomatoes. The name speaks for itself! An historic bar at the heart of ‘La Dolce Vita’ right at the top of the Via -it is well worth the climb! This American Piano Bar Ristorante is a great place to sample their world renown Martini Cocktails, and live music in the evenings is always on the menu! As can be seen on the left hand side of the photo their garden booth is a wonderful bistrot offering international and traditional cuisine. Harry’s Bar is open from 11 – 02:00 and the Restaurant from 12:30 – 15:00 and 19:30 – 01:00. Sundays Closed. Just around the corner from the Spanish Steps La Capricciosa is the ideal place for a good quality meal at reasonable rates. Not to be missed is their house specialities including tagliatelle with lobster, Octopus Carpaccio, and veal medallions with savoury pudding of aubergine. This inviting restaurant is a real treat even before you have sampled the chefs cream caramel! Ara Pacis Restuarant – La Capricciosa. You can contact this central restaurant on 0039 06 6878636, via fax 0039 06 6878480 or send them an e-mail at info@arapacisrestaurant.it We would be more than happy to make reservations for any clients staying at the Bed & Breakfast De Cappuccini.